In case you have discovered Metacrawler Toolbar installed onto your web browsers without your own authorization, it might be safe to say that this application is unreliable and therefore requires removal. Of course, you may have installed the program onto your Google Chrome, Mozilla Firefox or Internet Explorer browsers yourself. As our researchers have discovered, the plugin can be installed from several different sources, including metacrawler.com/info.metac/tbar and metacrawler.ourtoolbar.com. The first source is managed by Infospace, the same company which manages metacrawler.com as well. The second source you can download the toolbar from belongs to Conduit, and the presented application simply uses the name of the application to lure more computer users into clicking the Download button. 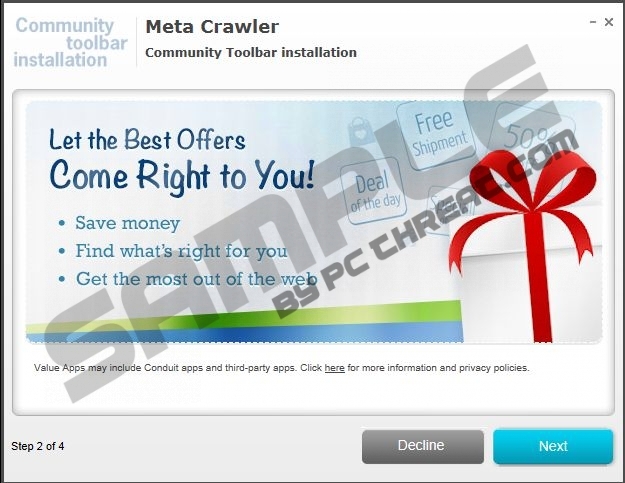 Overall, we recommend that you remove Metacrawler Toolbar from the PC, and this article will help you learn how. If you continuously use metacrawler.com as your default search engine, you may be interested in downloading the presented toolbar. Right now the application is not available, which is why many decide to acquire the program elsewhere. In fact, we do not recommend trusting the official download page at all because the search engine is quite unreliable as well. It has been discovered that when using this search engine you will face sponsored search results and related search results, which could link you to sites managed by unknown third parties. Now, if you choose to download the program from a third party distributor, like Conduit, you could end up installing a number of undesirable programs. For example, Value Apps is an unreliable plugin which could be installed together with Metacrawler Toolbar Community Toolbar. If you do not want to end up installing malware onto your personal computer we strongly recommend that you refrain from installing software from unreliable sources. Metacrawler Toolbar removal is not the most complicated task, even if you are inexperienced and you have never deleted unwanted programs before. Nonetheless, before you commence the operation we advise installing a reliable scanner to examine the system and determine what programs require removal. There is a chance that other unreliable and undesirable applications are running on your PC. To ensure that you do not need to worry about Windows protection and malware removal in the future you should install authentic security tools right away. Of course, if your virtual security is not something you prioritize you can follow the manual removal instructions presented below. Open the Start menu by clicking the Start button located on the Task Bar. Now click the undesirable application and then select the Remove button. Quick & tested solution for Metacrawler Toolbar removal.